Patagonia is a sparsely populated region located at the southern end of South America, shared by Argentina and Chile. The region comprises the southern section of the Andes mountains, as well as the deserts, steppes and grasslands East of this Southern portion of the Andes. The weather in the Patagonia is very extreme and unpredictable with generally lots of wind and very cold temperatures. The Patagonian landscape is breathtaking with its vast rolling hills that head into the more rugged mountain peaks. Patagonia is one of the most extreme places to hunt in the world and offers a wide variety of game such as llama, Fox, Hare, Rabbit and Beaver to name a few. The best time to go hunting here is in summer, the wind is not so strong, the temperature is not as extreme and they have daylight until about 12:00 at night unlike the winter, when it gets dark at 4:00 pm. 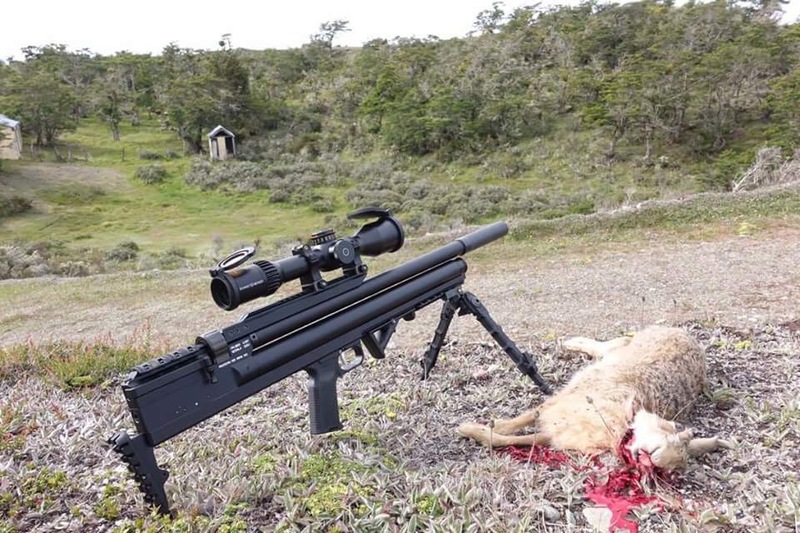 For the people that live in Patagonia, hunting is life and becoming very popular for Airgunners such as Claudio Flores. 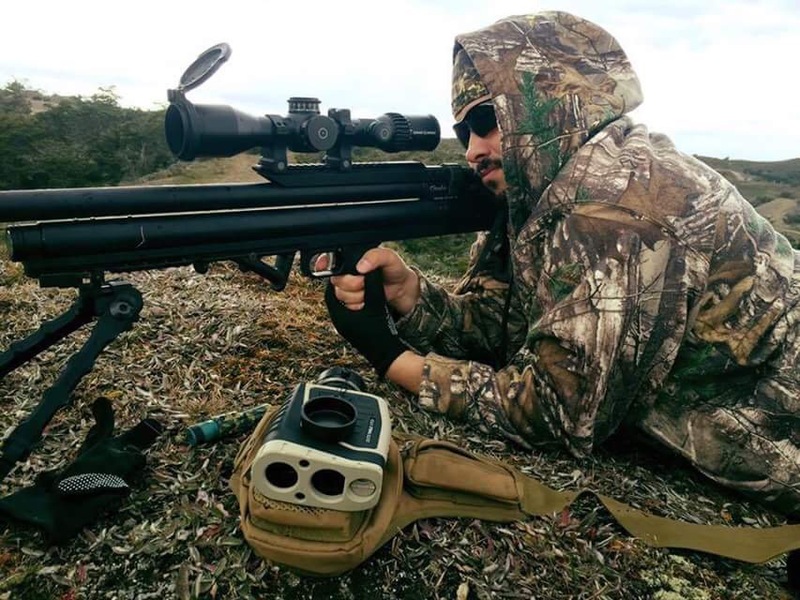 Claudio is a 35 year old native to Chile that has enjoyed hunting with Airguns for over 15 years. He is what you may call an extreme hunter and one that doesn’t let a cold, windy day keep him from the thrill of the hunt. Claudio hunts a variety of animals, one of which is the giant Beaver that can reach weights up over 60 pounds. In 1946, the Argentinian government imported fifty beavers from Canada, which were to be released in several lakes with the intention of creating a commercial fur trading industry. Though a viable industry ultimately failed to materialize, the introduction of the beavers into the region has had far-reaching consequences. Tierra del Fuego National Park in Argentina is especially threatened, as the beavers are destroying long-protected trees. The animals have spread beyond Tierra del Fuego itself into the Brunswick Peninsula of Chile, and the government fears further penetration into continental South America. The beavers already threaten around sixteen million hectares of indigenous forest. Unlike many trees in North America, trees in South America often do not regenerate, ultimately destroying the forest. As well as falling trees, beavers create dams that flood certain areas and thus drown other trees and vegetation. Flooding from beaver dams also damages roads and cattle-grazing pastures. Claudio hunts all year long but generally hunts Beavers during the warmer months as it makes reaching these areas much easier. As you can see (below) the areas are vast and offer many places that offer great habitat. Generally Claudio does a review of all his rifles and makes it public on his YouTube channel “Chile Patagonia Airguns” where he gets to let the world know what he does with these guns in Patagonia. Hunting is his passion in life as well as working hard as he can to enjoy it. Weekends are always reserved to go practice with his 13 year old son Dan and to show him a little about extreme hunting. Claudio and his son hunt together often as well as Dan helping with the excellent film and photographic footage they have achieved in the past. 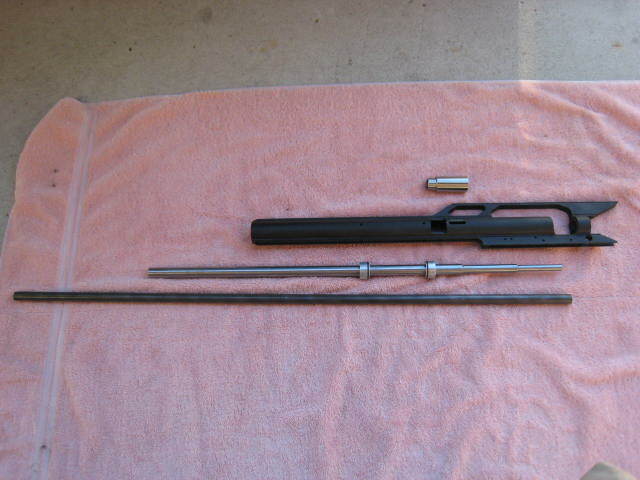 The American Air Arms .357 Slayer arrived to Claudio after a long 15 day hold in customs, from there it made it’s way to his home where it was fitted with a Schmidt&Bender scope and Accu-Tac SR-5 bipod. 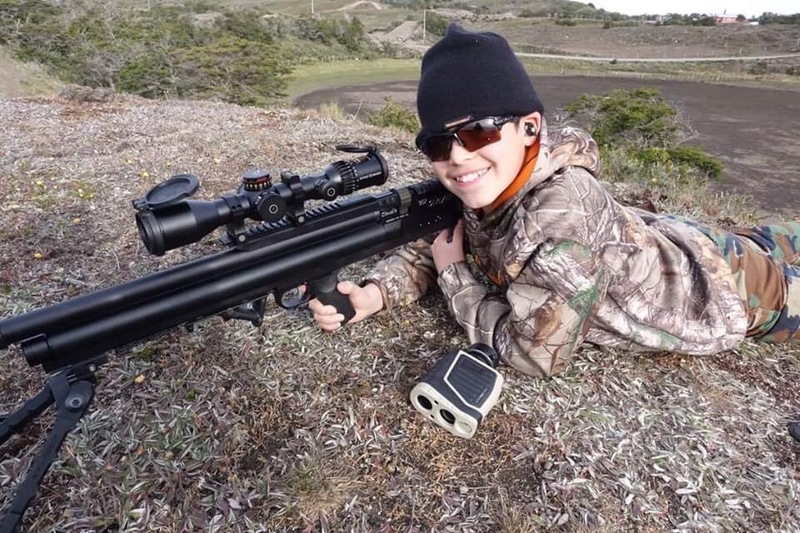 After spending a day with the gun and getting it zeroed in, he was ready to take the .357 Slayer on its first adventure into the Patagonia wilderness. 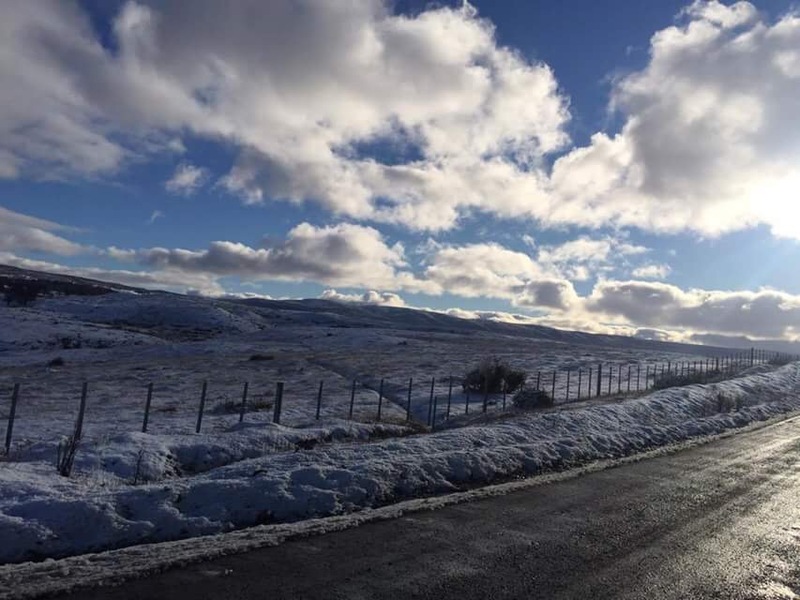 Claudio and Dan spent some time driving around until they found a good location that had a good population of rabbits, hares and Fox. Most of these are far within reach of a gun such as the .357 Slayer that was slinging 129 grain Aeromagnum hollowpoints at near 960 fps. Claudio was sad for the night before his cousin had a Fox kill two of his beautiful cats and 12 chickens, so he set out in trying to finding it. In Patagonia the foxes are very harmful, the problem is when they get into the village and start being a threat to the integrity of the family you have to make the decision and control them. 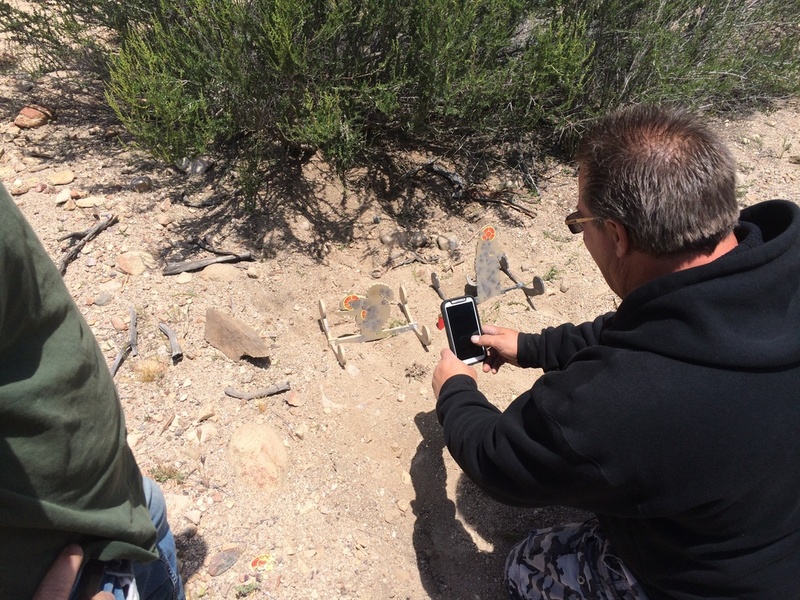 Dan was the first to spot a rabbit at 202 yards, this was correctly measured with the Bushnell Elite rangefinder. Claudio had the slayer zeroed at 50 yards and had to correct the turret 8.5 mills according to his table of measures, while Dan was looking through his Steiner binoculars telling his dad to stay focused. After several moments Claudio took a deep breath and fired. They looked at each other for a span of 4 seconds and then it was a scream that you could imagine was heard throughout the city. 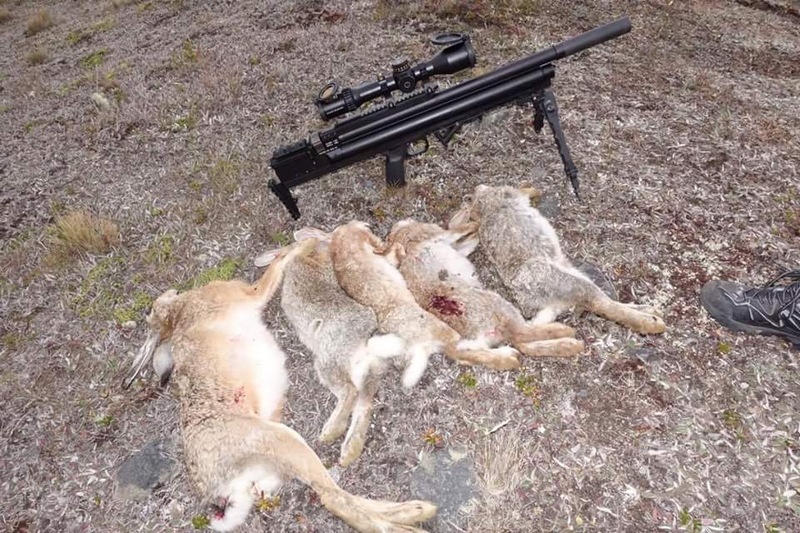 Claudio has had many of the best high end Airguns Airguns and is now a firm believer in the true power of a big bore Airrifle when it comes to long range. 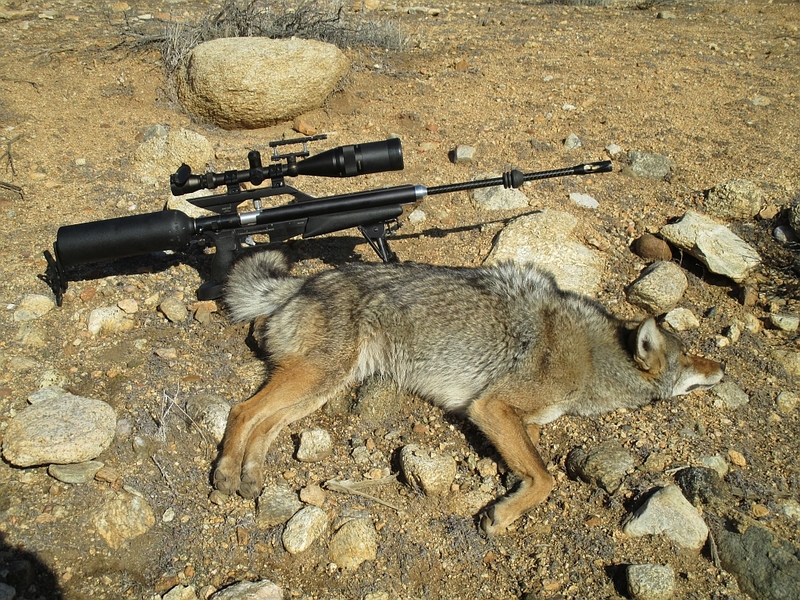 He has stated that when you shoot a big-bore, everything else seems small such as the .22 and .25 as he’s used to hunting with. Over the rest of the day Claudio was able to bag several rabbits at 75,95,125 and 202 yards. Patagonia is one of the most beautiful and unforgiving locations in the world that does too offer many unique hunting opportunities for Airgunners. I hope to visit very soon and to meet up with Claudio and Dan, joining them on one of their many adventures that at the least can be brought to you here. 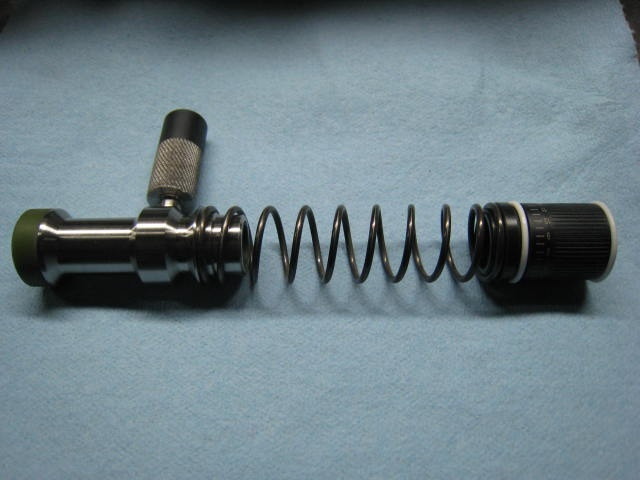 American Air Arms designs always start from a clean slate and are never just another example of the industry standard. They are engineered to meet a specific vision, purpose and performance goals before any chips hit the shop floor. When the vision and purpose are clear, the performance goals are analyzed and found to be reasonable and attainable, only then can the actual design begin. This philosophy is what makes the guns lean, clean and gives them the exceptional effectiveness, performance and purpose they are known for. The creation of the EVOL TAC was first just a great idea out of pure LOVE for Airgunning and the need for the ultimate in performance and durability. 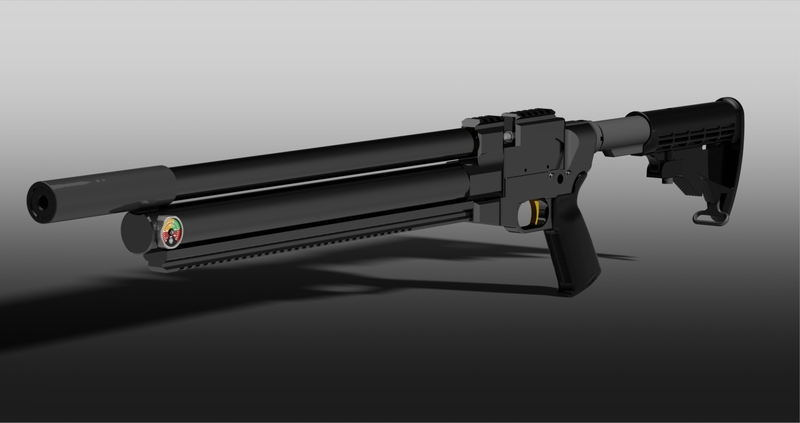 The EVOL’s first rendering was putting the idea into a usable format that could be changed and adjusted before the actual rifle was ever built. 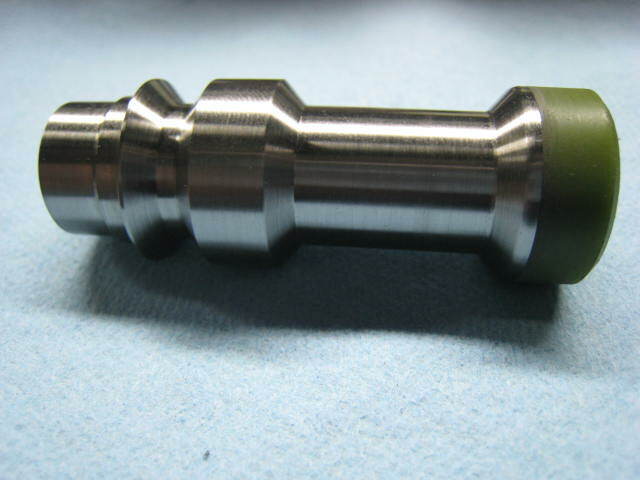 American Air Arms products are designed using 3D CAD and manufactured on state of the art CNC machining centers completely in the USA. 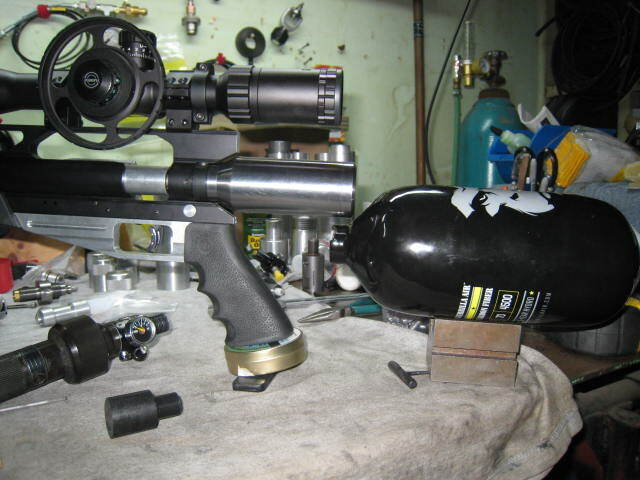 This is one of the first early model prototype EVOL .30 TAC’s that’s been outfitted for field testing. This rifle has been outfitted with the Magpul PRS buttstock, Magpul MOE grip, Magpul AFG foregrip, Magpul RSA QD sling mounts, nylon/neoprene sling, Burris Tactical 30mm scope mounts and a Hawke Frontier 5-30 Scope. The total weight is 10lbs 4 oz. PRS buttstock with the RSA QD picatinny mount. The PRS is a fixed stock with adjustable pull and cheek riser. This stock is much heavier than collapsing or folding units, though it is very rigid and doesn’t rattle around as some others may. RSA Quick Disconnect mount on the lower makes adding a sling both simple and adjustable. The amount of components available for this platform are nearly endless and can meet just about anyone’s needs. Lot’s of Airgun shooters are going to feel a sense of “Home” when handling this rifle. It’s really a testament to Eugene Stoner’s AR-15 design; the EVOL effortlessly fell into the AR form. I love the big bores but have been bugging Tom for two years to build something like this. I’m not sure if Tom Costan will agree but I think he surprised himself, it came out nicer than he imagined. 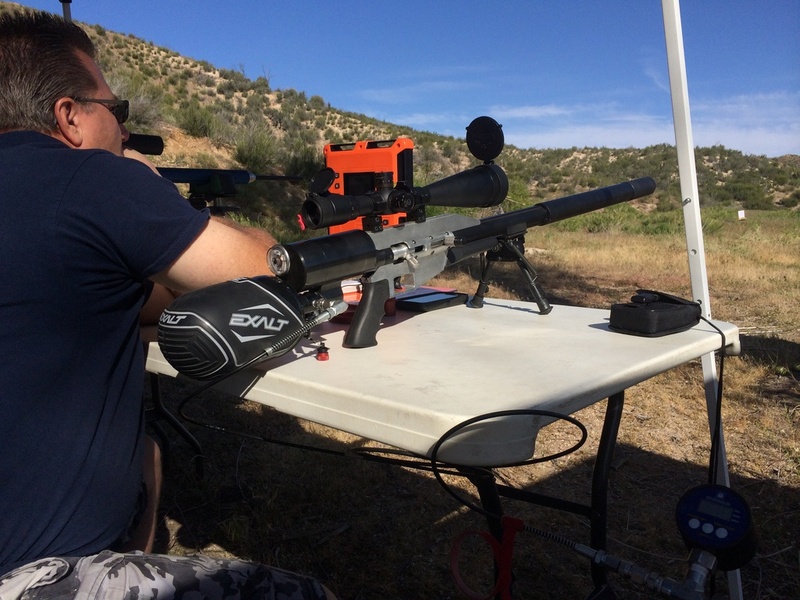 I have shot both guns at the Extreme Benchrest and to be honest the whole time I kept thinking about how great the TAC version would be to hunt with. Both the TAC and tradition EVOL rifles are very lightweight and as the SLAYER are near indestructible. The side-lever design is beyond a pleasure to use and will make follow up shots a breeze when hunting. The EVOL is shooting very consistently at 890 fps with the JSB 44 grain pellets and too a very unique feature is that the magazine has been designed to accommodate Polymags as well. 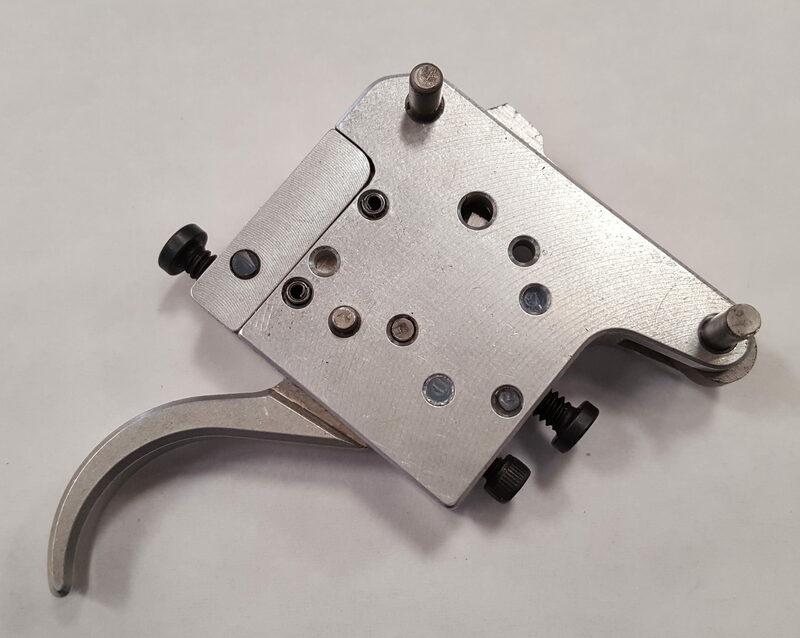 This is the trigger group for the Slayer Hi-Power Rifle and EVOL Sport Carbine models. It’s a package type unit that is adjusted before assembly into the action. It too is also possible to adjust once installed as well. 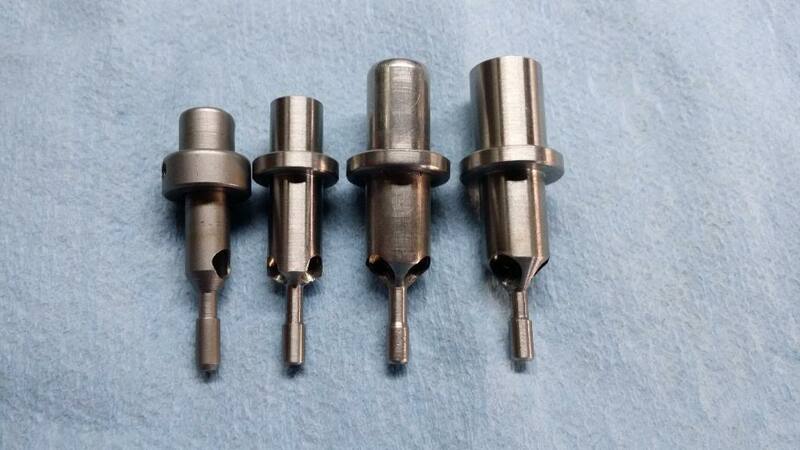 -Wire EDM cut and heat treated tool steel sears. All EVOL model rifles are regulated to deliver consistent shot to shot velocity and maximize shot count. 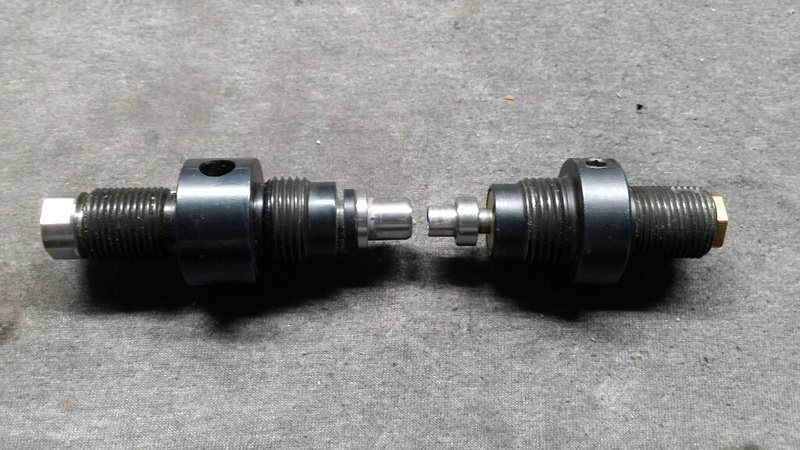 The side mounted gauge and foster fill was the solution to many complaints and concerns with the end of tube placement. The magazines are very similar to the EVOL‘s big brother the SLAYER in being all aluminum and self indexing holding 8 rounds. The barrels twists were selected for long range performance with the intent of eliminating spiraling past 100 yards. Several rates and land configurations were evaluated as well as some “name brand” barrels. 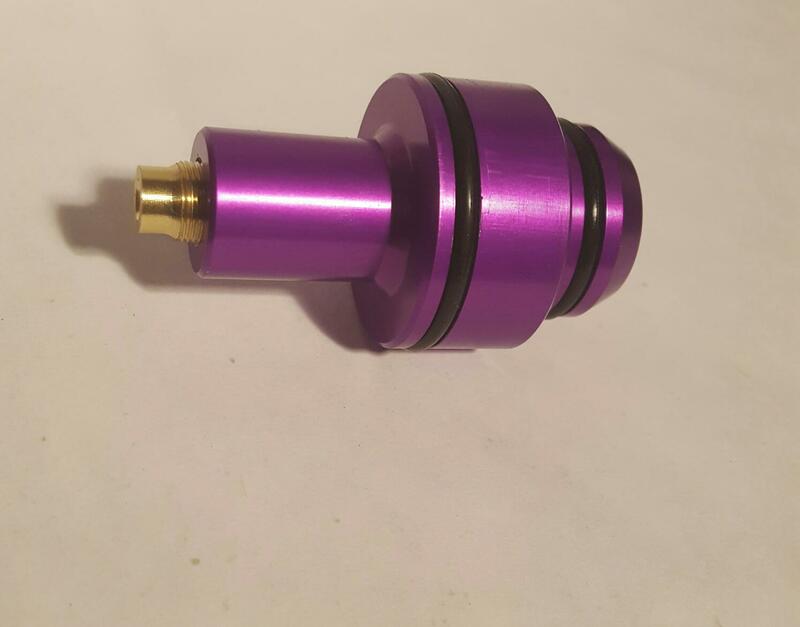 The twist rates are designed around pellets and are NOT suitable for slugs. The goal for EVOL’s is the most ergonomic, consistent and accurate pellet shooter available while optimizing performance for the most common commercially available pellets. * Tactical weight with Magul MOE Buttstock. Quality cannot be obtained without understanding the limitations of manufacturing with modern technology; every American Air Arms Airgun is a combination of vision and technology combined with passion for old world craftsmanship. An American Air Arms Airgun will exceed expectations, provide exceptional service, pride of ownership and one that will be shared with future generations.